In Barbados, there is a pall cast upon this commemoration because of widespread concern about the effects of job retrenchment within the public service. There is conjecture that the job losses will cause an increase in crime, deprive families of the basic necessities of life, stifle purchasing power that feeds business and will create emotional trauma too great to bear. There is no doubt that Barbados urgently needs to improve but we will not perish. I don’t subscribe to these dark projections. I am concerned about the perception that those who face job loss will be unable to survive or prosper. I recognize that some will be adversely affected by this persistent tone. As one who has many times been faced with a “no job-no prospects” scenario, I prayerfully offer an alternative interpretation. If you think about it, all of us have been faced with “worst case scenarios” at various points in our lives. Scenarios that threatened or abolished plans upon which we based our definition of a good future. The worst happened; and we are still here. Thank God. If you want to hear God laugh –tell him what you are doing tomorrow. We have also made plans that did not unfold as we intended, yet the outcome was actually better than we could have imagined. For me, coming to live in Barbados is a prime example. Thank God. So in our haste to condemn and criticize, know that you have just as much chance of being wrong as the next person but it’s not you facing public scrutiny. Let’s show some love for the government’s efforts to make improvements on our behalf. As a Boy Scout, I was taught the motto: “be prepared”. Not everything is predictable and a prudent person must develop mechanisms to cope with that reality, whenever it occurs. Illness, death of loved ones, catastrophic natural disasters and our own aging and mortality are realities that are relentless. The good news is that we are not yet dead but many of us have experienced occasions when we might have died or been killed. Somehow God’s amazing grace and perpetual love preserved us –for a purpose. Every time I acknowledge one of these specific examples of God’s grace, it fills me with gratitude and joy. 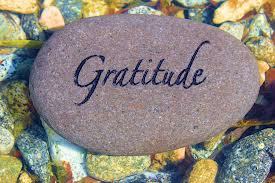 Gratitude is a powerful gift that nurtures my spirit. It is the foundation of my resolve to move forward to the positive outcomes that he has in store for me. It does require some humility and discernment to know that God’s guidance trumps my arrogant tendency to insist on doing things my way. Over all these years, God has been there, even when I did not acknowledge his presence. There is great comfort in knowing that “the fear of the Lord is the beginning of wisdom”. I pray that each of you who is in any way troubled about what to do next, will know or learn that God is calling you nearer. This entry was posted in Articles, Change, Communication, Perspectives and tagged Barbados, Change, Emotion, God, Performance, Reflection, Vision by StrongWords Live by Dennis Strong, CMC. Bookmark the permalink.